Improve Your Real Estate Operational & Financial Reporting! We have pre-built dashboards that connect to your accounting system. We give you the reporting you’ve always wanted! 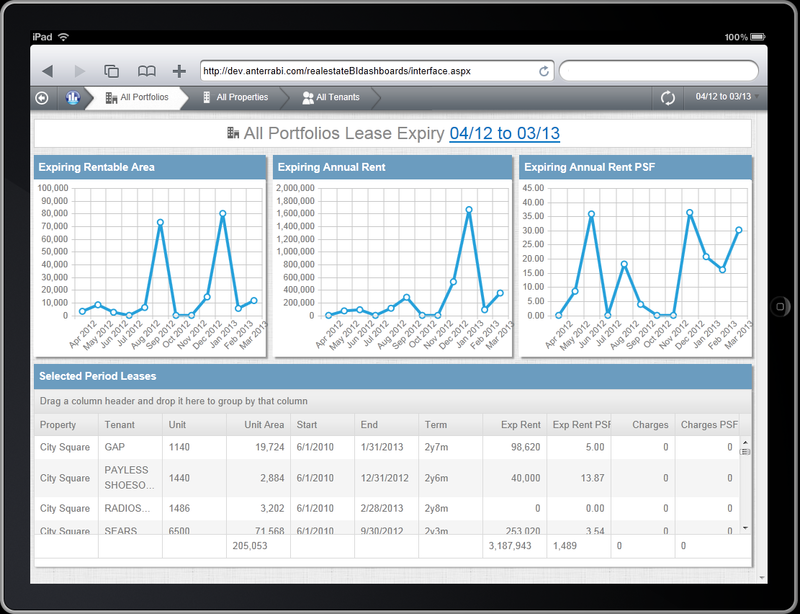 Anterra provides enterprise quality financial and real estate dashboards and reports to you at a fraction of the cost. We deliver world class reporting across your organization. anterraBI™ contains drill through financial statements, real estate dashboards, scorecards and analytic tools to quickly see where you are performing outside of your plan. Mobile BI. Our browser based dashboards with drill down capability enable you to get to the source information instantly from wherever you are. Access AnterraBI from your iPad or computer. Easy to use. anterraBI’s interface is built by people with extensive Real Estate experience along with feedback from industry leading companies. Cost Effective. Our cloud based offering means no additional cost for hardware and no additional burden on your IT staff to maintain our application. Understand your NOI variance trends (both positive and negative) and drill through to our consolidated income statements to your underlying transactions. We bring transparency and clarity to your monitoring of property performance giving you a clear view of where you are compared to your plan. Your properties can belong to an unlimited number of portfolios to allow you to analyze variance by ownership, property type, city, state or any other desired grouping you like. Benchmark your properties and tenants by key performance indicators like AR, NOI and expiring rent. Get your stars and dogs aligned. Our statements export to Excel instantly with your account groupings for you to perform additional analysis. We identify which properties have the largest positive and negative budget to actual variances for both year to date and trailing 12 months so you can investigate. Our roadmap includes variance comment tracking so you can stop entering comments in Excel. We have drill through cash trend graphs to eliminate daily cash reporting spreadsheets and let you see your balances over time by consolidation group. We’ve helped many construction companies, real estate developers who manage construction and real estate owners improve their businesses through our pre-built reporting. Click here to go to our customer success story page or click here to go to our Construction BI home page. Call us at (832) 539 1400 and press 1 for information or fill out our contact us form form for more information. We provide a single source of truth for your reporting. Stop wasting time in meetings debating where numbers come from. Our reporting is available anywhere, period. You can access it on any computer (PC or Mac) or on your iPad. No more logging into VPN’s or remote desktops, access is instant. We have worked with real estate developers and owners around the world to develop reporting with built in best practices. We can report across multiple systems. This helps eliminate management by spreadsheet. We’ve developed a data cube that lets us do trend analysis so you know where you are heading. We have trend graphs for financial ratios, net income budget vs. actual by company, portfolio and property AR, NOI, lease expiry and occupancy. We use the best Microsoft reporting technology available. Let us manage the technology while you focus on your business.